Contents Which Lodge; Preparations; Sublime Degree of Master Mason; Masonic Study; Secrecy of Masonry; Lodge Courtesies; Fees and Dues; Business Meeting; Belief in God; On a Committee; The Ballot; Examinations; Making a Place for Yourself; Being an Officer; Trading With Masons; Masonry in Business; Charity; The Sick; Masonic Home; Masonic Clubs; Among the Profane; Dead Wood; Use of Masonry; When Masonry Seems to Fail; We Meet Upon the Level; Bearers of the Torch; Master's Wages. Experienced legislators, editors, civic leaders, business executives, and club officers all pronounce "Robert's Rules of Order" the best parliamentary guide in the English language. Its amazing acceptance entitles it to the claim of being the recognized authority in parliamentary law. Now, for the first time, the most comprehensive, understandable, and logical guide to smooth-running meetings has been revised for use in Masonic lodges and appendant bodies. Includes "The 25 Ancient Landmarks Of Freemasonry" by Albert Mackey and more. Illustrated by Grand Lodge decisions from the date of the Union. In this book, the Book of Constitutions has been followed as closely as is consistent with the production of a continuous work and as far as possible, the author avoided the expression of personal opinions. The urgency of this subject lies in the fact that many governing positions in today's evangelical churches are being filled by those who practice Freemasonry-quite possibly including the pastor of your church! 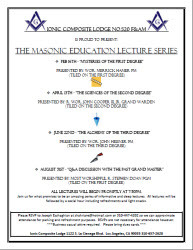 Lodge members emphatically deny that Freemasonry is a religion; however, it is only logical to conclude that any group or institution that does the following must be considered a religious group: meets on a regular basis, uses altars, prays to a deity, holds rituals, baptizes, meets in temples, has deacons, serves communion, operates according to a generally agreed-upon doctrine. How much of Freemasonry has infiltrated our churches? Why are Masons allowed to retain their positions of leadership in our churches? Why is Freemasonry touted as a harmless fraternal organization when its roots are steeped in mysticism, magic and murder? These are just a few of the many questions author Keith Harris answers in The Masonic/Christian Conflict Explained. We must take this issue seriously if we intend to take back our churches from unbelievers. Contents Masonry and Religion; From Darkness to Light; Initiation, Real and Ceremonial, The Purpose of the Mysteries, The Ideal Lodge; Light on the Way, The Knowledge of Yourself, The "G", The Ladder, The Superstructure, The Cable-Tow, The Apron, The Wind, Seeking a Master, Wages, The Law of the Mount; Fulness of Light, Observations and Examples, Apocalypsis; The Past and Future of the Masonic Order. Freemasons, this book should be in your Masonic library! Containing Monitorial Instructions in the Degrees of Entered Apprentice, Fellow Craft, and Master Mason, with Explanatory Notes, Emendations and Lectures, Together with Installation of Officers, Laying Foundation Stones, and the Ritual for the Lodge of Sorrows and the Ceremonies of Consecrating Masonic Cemeteries with Appendix and Forms of Masonic Documents, Masonic Trials, etc. A rare reprint of a masterpiece which demonstrates the antiquity of the Masonic mysteries and their relation to other schools of antiquity by attempting to trace the development of Masonic Ritual back to the medieval stonemasons, and from there to other schools. In his review of this book in the EQUINOX, Aleister Crowley commented that Brother Yarker seems to have read every old Masonic manuscript ever written. This book is the sole source for some obscure bits of Masonic history. Yarker was the head of the Ancient and Primitive Rite of Freemasonry in England, and may have possessed more first-hand knowledge of Masonic rituals than anyone else of his time, including A.E. Waite. A Review of their Origin and Antiquity with a General History of Freemasonry and its relation to the Theosophic, Scientific, and Philosophic Mysteries. Contents Archaic Legends; Proto-Aryan and Aryan Civilization and Mysteries; Mysteries in Relation to Philosophy; Philosophy in Relation to Masonic Rites; Mystic and Hermetic Schools in Christian Times; Recapitulated Proofs of Ancient Masonry; Masonry in Britain and Saxon England; Masonry in Norman Times and Modern Times; Origin of the system Termed High-Grade; Freemasonry in the Grand Lodge Era; Series of Constitutional Charges.